Students from Falmouth School and local primary schools were recognised for another outstanding year of sport at the recent Sports Presentation evening. Students of all ages across the primaries and Falmouth School have once again shown what talent they have with an impressive and ever growing list of achievements. A packed crowd of over 150 guests came to see various awards handed out for excellent training, improvements, performance and volunteering. With such a huge field of over 1000 students to select from, all nominees and winners did exceptionally well to gain their respective recognition. 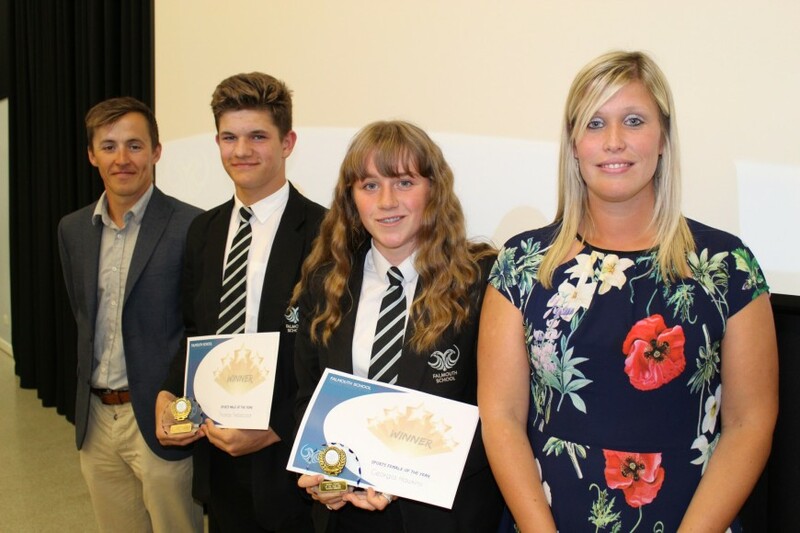 The evening was compered by head of PE Mrs Benney and guest World Triathlon Champion Neil Eddy, who gave out awards after a powerful presentation about his journey through sport. The evening kicked off with a look back at the hugely successful recent sports festival to set the tone for what was another superb evening. The primary schools were the first to be recognised for their achievements, with Isaac Hurtel-Hymans of King Charles School winning the Year 3 and 4 Primary Sports Star award, with Maisy Hawkins of St Francis School winning the award for Year 5 and 6 students. A new award this year, saw Matthew Hackwell (Marlborough), Eve Hosen (Falmouth Primary), Jocelyn Ecclestone (St Francis) and Esme Brokenshire (King Charles) recognised as Primary Sports Ambassadors of the Year. The first Falmouth School award of the night went to Poppy Rudolph, who was named Sports Volunteer of the Year. It has been another hugely successful year for team sports at Falmouth School and in a tough category, the Indoor Rowing team were crowned the winners. Awards were split between Lower (year 7 and 8) and Upper School (years 9, 10 and 11) with awards for Sports Training, Sports Improvement, Sports and Dance Performance and Dance Commitment. Lower School winners included; Harry Campbell, May Keeble, Katie Etchells, Jasmine Squibb and Lauren Vosper, with; Luke Richardson, Shannon Watkins, Hermione Brown, Lucy Murray and Poppy Morris scooping the Upper School Awards. The Sporting Excellence category was a chance to look across Falmouth School’s vast array of outstanding students performing within their sports outside of school, showcasing many superb individual performances with a video montage. The final awards of the evening were for Sporting Male and Female of the year and were collected by Thomas Trebilcock and Georgia Hawkins. Head of PE Mrs Benney spoke of what was a fantastic evening “Our sports presentation evening is a chance to acknowledge and celebrate the tremendous sporting talent we have in the community of Falmouth and it was a truly superb evening. I feel incredibly honoured to teach so many of the amazing students and witness their sporting talent first hand. Last night proved the sporting talent we have within the community of Falmouth is exceptional and nominees should be incredibly proud of their achievements in sport/dance this year.